American poetry has captured the experiences of war spanning from Walt Whitman’s civil war poetry, through Ezra Pound’s World War I poem “Hugh Selwyn Mauberley” to Robert Bly’s 1967 Vietnam Era book The Light Around the Body, to most recently Iraq veteran Brian Turner in his 2005 book about Iraq Here, Bullet. What American poets will say about the current Iraq war remains to be discovered. This is true partially because American commercial and literary magazines continue to publish poetry mostly involving domestic scenes or private emotions. Americans have to search to find poets who concern themselves with war experiences or social reflections. Well, the best things often are hard to find anyhow. For instance this fall the September, October, and November issues of the Poetry magazine lack a single poem addressing the ongoing U.S.-Iraq war. Does war not matter? This anecdote is typical. U.S. literary publishing’s silence—for, against, or solely documentary about the Iraq and Afghanistan wars—mimics the daily detachment of everyday American life for most people beside U.S. soldiers and their families. Likewise the current Executive Branch’s challenging of the very existence of a checks-and-balances government—its use of secret prisons and torture forbidden by U.S. law—is mentioned in published U.S. poetry as much as at polite dinner parties. Rarely. Rather than being in the American tradition, this silence should be seen as a betrayal of the spirit of American poet Walt Whitman. It is a poor heir to the robust debates of the Thomas Jefferson and Alexander Hamilton and the Constitutional Conventions—whether or not their conclusions were perfect, adequate, or flawed. U.S. literary publishing’s silence—for, against, or solely documentary about the Iraq and Afghanistan wars—mimics the daily detachment of everyday American life for most people beside U.S. soldiers and their families. American poetry has not always been on the sidelines. When seminal American poet Walt Whitman published his first Leaves of Grass in 1855, he included in “Song of Myself” lines that championed women’s rights and spotlighted the injustice of slavery. Whitman did so back when women could not vote and slavery was legal in the South. Seminal American poet Langston Hughes shows the pain as well as joy of jazz in his famous jazz poems. Hughes talks about dreams in the poem “To You” and also eviction from an apartment in the poem “The Ballad of the Landlord.” In fact historians one day may find that American poets do address today’s social as well as personal issues at open-mikes, in cafes, and through local small presses—but that reputable academic and commercial publications are ignoring this cornucopia. Before the second Iraq war began on March 19, 2003, U.S. First Lady Laura Bush attempted to have a symposium on Walt Whitman, Langston Hughes, and Emily Dickinson in February 2003. One poet invited to that symposium was rumored to be preparing a statement against it. This West Coast poet, Sam Hamill, was being true to the legacy of American poetry by choosing to address a major social issue before it affected so many. In response Ms. Bush cancelled the symposium before it began. As a result Mr. Hamill began collecting poems online—over 11,000 poems against the then-impending war. A Poets Against the War movement was born, and their Web site www.poetsagainstthewar.org remains active. American poets do address today’s social issues at open-mikes, in cafes, and through local small presses—but academic and commercial publications are ignoring this cornucopia. I myself became inspired by this to combine my own activism and writing. I knew U.S. poets would not be able to find publishing opportunities for their verse that glanced beyond immediate lives to issues concerning us all. I wanted to provide a forum for these poets to get their words out, and so in May 2003 began publishing Poems Against War: A Journal of Poetry and Action in 120-copy editions. In 2007 it now can be found at www.poemsagainstwar.com, and the entire series is archived at the University of Wisconsin, Madison library, Special Collections Department. 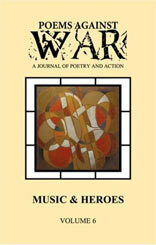 This work also has led me to review how war has appeared in American poetry. Let’s turn to Walt Whitman. But the lovers I recklessly love-lo! how they master me! Lo! me, ever open and helpless, bereft of my strength! Utterly abject, groveling on the ground before them. Walt Whitman in his poem “Not My Enemies Ever Invade Me” realizes that while war is frightful, the most difficult fear we face is love. who become loving women and men. why not a higher standard of loving? Has our society prioritized zealous work and necessary living over zealous living and necessary work? Later in the poem he notes: “Thoreau could live a whole year / on money from working 6 weeks.” Has our society prioritized zealous work and necessary living over zealous living and necessary work? That is the question Antler seems to ask. Where is the Western world one and inseparable? The democracy? The eternal progress? I am expecting the main things from you.